What: Plastic humanoid ant soldiers that came in two main colors--orange and blue--representing opposing sides in battle. Each figure had painted details as well as a removable rubber abdomen, and some came with removable accessories such as a grenade, missile or ammo. 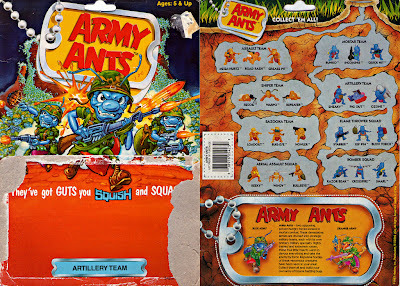 Oh man, besides M.U.S.C.L.E and M.I.M.P, Army Ants were my third mini figure love of the 80s. I'd love to snag a full set of them some day. So awesome! Yeah! There are also different colored ones released in Europe that I'd like to get a hold of. I think they're called Kombattini or something like that. What a strange little toy. We had a ton of these laying around the house. 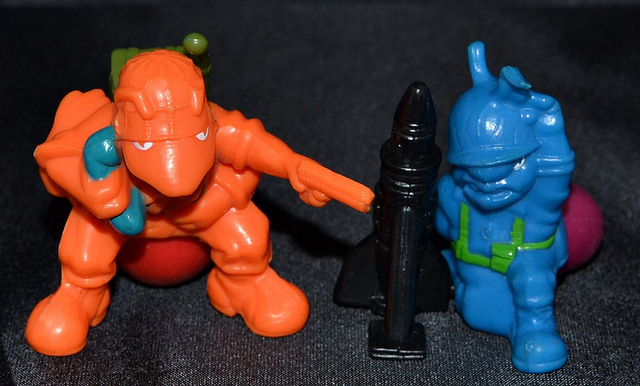 I think we got them while visiting Grandma in Bandon, Oregon, where I've made a lot of other strange toy discoveries. During one visit circa 1998 or later, we were in this little department store and I found a boxed 30-30 on the shelf from the Bravestarr toy line that hadn't seen the light of day since the late 80s. Somehow they still had one in the back rooms that went unnoticed for ten years, I guess, and put it out on the shelves to sell it.